South Coast Water District customers can expect to receive rate change notices this week as the utility proposes its first rate increase since 2013. 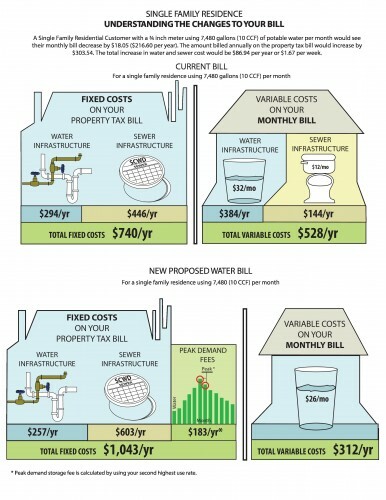 The changes come in response to the need for covering the increasing cost of water purchased by the utility from wholesalers, costs associated with maintenance and/or replacement of aging infrastructure and the need to review its rate structure—due to the Proposition 218 water rates ruling in San Juan Capistrano in April 2015—district officials said. According to Andrew Brunhart, SCWD general manager, with the previous three-year rate notice coming to an end in June, along with the court’s Prop 218 decision in the San Juan water rates case reinforcing the requirement for water rates to have a justified link to actual costs, it was a natural to time to address rates and perform a full cost of service study. Carollo Engineers assisted in the study, which included a series of nine public board workshops and the detailed review of costs for every service, were used in the reevaluation of potential changes to the SCWD rate structure, Brunhart said. 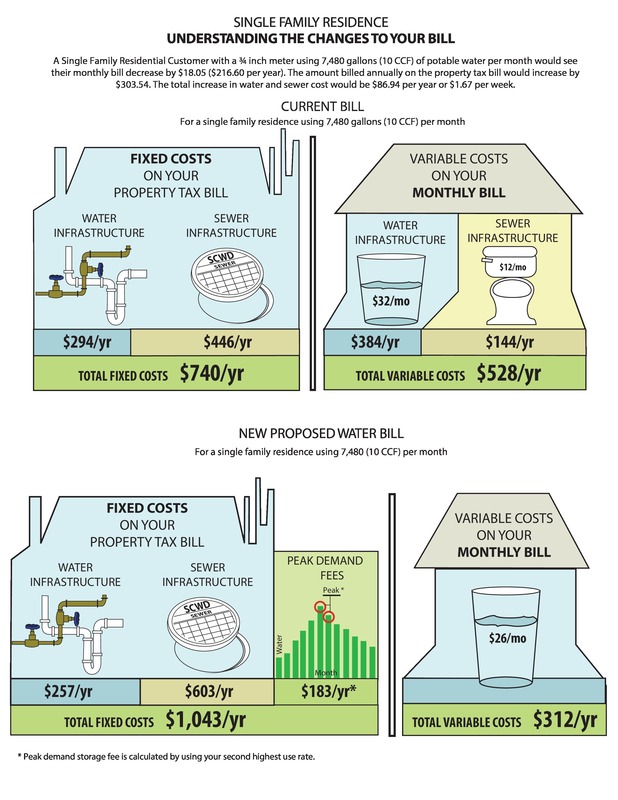 Under the proposed rate structure, a single-family residential customer with a ¾-inch meter and using 10 CCF, or 7,480 gallons of potable water per month could expect to see a total net increase of $1.67 per week. This example applies to the 9,500 single-family residential customers in the district. One CCF (a measurement of centum cubic feet, or hundreds of cubic feet) is 748 gallons. Because the proposed new rates shift the portion of fixed costs previously included in monthly bills over to yearly property tax bills, the same customer would see a decrease of $18.05 per month ($216.60 per year) on their monthly bill and a $303.54 increase on their annual property tax bill. “We have proposed to establish new rates going forward for the next five fiscal years,” Brunhart said, adding that the new rate structure supports water conservation and establishes more rate stability—to address the statewide theme of water demands going down, customers conserving more and water districts raising the rates. Wayne Rayfield, SCWD Board of Directors president, added that the same is true of the waste water conveyance system. “The pipes have to be there; the pumps have to be there even if no one flushes a toilet or drains a sink,” Rayfield said. Because costs change depending on customer usage—varying greatly from summer to winter months—water usage revenue at times does not cover the cost of fixed expenses, Brunhart said, the new rates shift fixed costs currently charged on monthly water bills (for water and sewer infrastructure) to customers’ property tax bills. Under the new rate structure, charges on property tax bills will include fixed costs for water and sewer infrastructure along with a peak demand charge. The peak demand charge, a new type of charge, will also encourage conservation, as it will be based on each individual customer’s second highest use month—because the highest peak month can be due to an anomaly such as a leak—and all customers will be charged at the same rate multiplied by their peak demand. Peak demand charges will change each year depending on customer water use. Rayfield said the change provides for more fairly distributed costs to customers. “This system promotes conservation because a customer can affect what their peak is,” Brunhart said, adding that the new rate plan was designed to provide fairness and equity by charging customers for actual costs, linked to rates. Charges for recycled water today are set at 90 percent of the cost of potable water and the discount is subsidized by potable water customers as part of “other rates” charged on their bills. As the board was looking at the water in the system, it adopted the concept of “water is water,” and proposed to do away with the discounted rate. In the proposed plan, recycled water will have no peak demand charge. So customers switching from potable water to recycled water will see a reduction in cost, but the district’s 36 current recycled water customers (the city, resorts, HOAs, etc.) will see higher rates. Under the existing structure, single-family residential customers are billed a fixed annual charge and a variable charge based on water consumption. 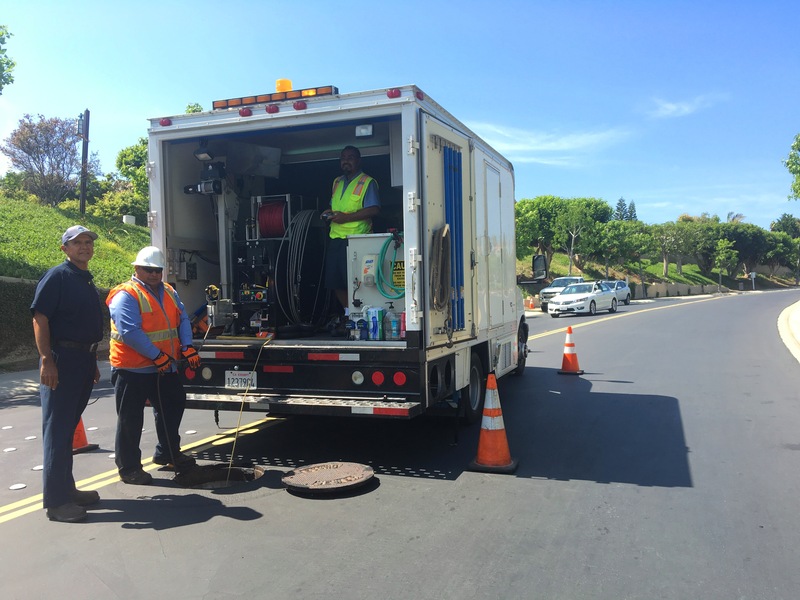 Because water contributed to the sewer system is not measured, the new rate plan would adopt a new concept in which single-family residential customers will no longer receive a monthly sewage bill. The costs will instead be charged on the annual tax bill and based on winter month usage average, by customer, multiplied by the sewer rate. Multi-family residences will continue on variable rates, but the rate is lower than the current rate because fixed costs will be removed. The categories of commercial customers will also be simplified from the current 29 categories, down to three: low, medium and high strength levels, based on the volume of waste water flow connected to each industry or business. The proposed rate increase is designed to help fund the district’s approximately $75 million worth of needed capital improvements, necessitated by deferred maintenance of infrastructure and the need for a local and sustainable water supply due to drought and ever-increasing wholesale water prices. 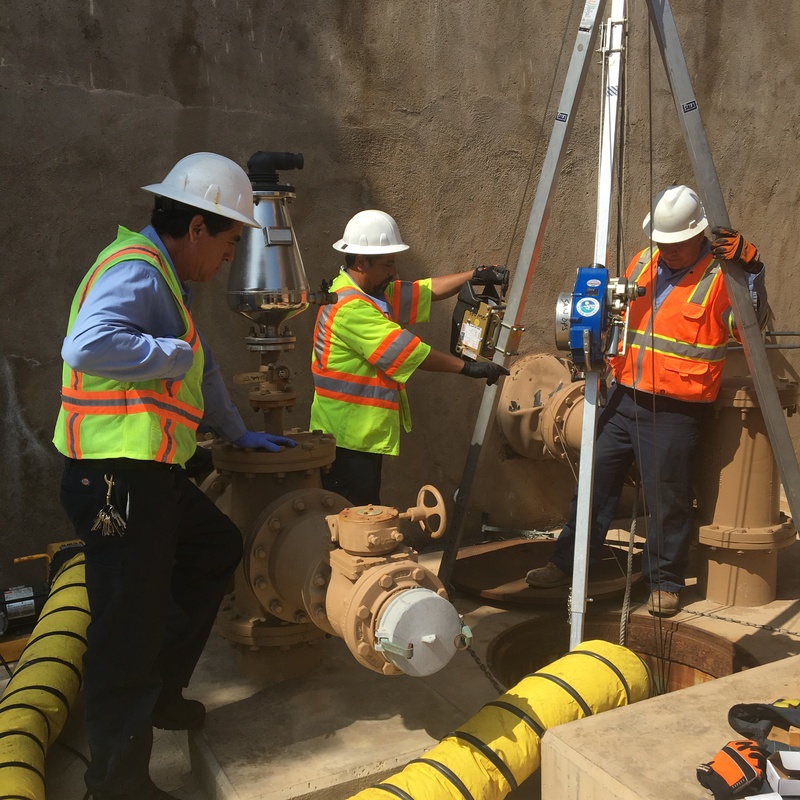 The new rates would provide some of the funding for the district’s proposed desalination plant’s estimated $90 million price tag, the refurbishment of the waste water tunnel running from the Monarch Beach border to Aliso Beach, an estimated $72 million project. The desal plant could produce as much as 15 million gallons of drinking water per day, and the tunnel currently moves a million gallons of sewage, 60 percent of which comes from Dana Point and 40 percent from South Laguna. All videos of previous workshops, presentations from the workshops, and answers to frequently asked questions (FAQs) are available online at www.scwd.org. A public hearing on the proposed rate changes is set for 6 p.m. on June 23 at Dana Point City Hall, Council Chamber, 33282 Golden Lantern in Dana Point.